PT ASDP Indonesia Ferry (Persero) - Indonesia Ferry is a well-established state-owned sea transportation services company, headquartered in Jakarta. Indonesia Ferry operates primarily as an operator of roll-on/roll-off ferry transport services. Its business include ferry transportation services and port management for passengers, vehicles, and cargo. The Company was first established in 1973 as Proyek ASDP Ferry (PASDF) under the Ministry of Transportation. PASDF was changed to PASDP and transformed into Perum ASDP in 1986. Later in 1992, Perum ASDP transformed to PT ASDP (Persero). In 2004, PT ASDP (Persero) was changed to PT ASDP Indonesia Ferry (Persero). PT ASDP Indonesia Ferry (Persero) is non listed state-owned company and is fully-owned by the government of Indonesia. 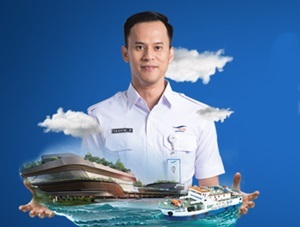 As of December 2016, Indonesia Ferry runs its business through 30 branch offices served by 4,122 employees. In 2016, the performance of Indonesia Ferry is showing good results. According to PT ASDP Indonesia Ferry (Persero) Annual Report 2016 as cited by JobsCDC.com, total asset growth by 16.12% amounting to Rp 6,229.54 billion in 2016 from Rp 5,364.75 billion in 2015. The Company’s total operating revenue in 2016 was down 0.81% at Rp 2,311.31 billion as compared with Rp 2,330.42 billion in 2015. In year 2016, Indonesia Ferry recorded total profit of Rp 233.41 billion or 4.74% increase from Rp 222.84 billion in 2015. Staf Bisnis Pelabuhan (PBPL) : S1 Management, S1 Business Management, S1 Civil Engineering, S1 / D-IV Transportation, S1 Information System or relevant. Staf Bisnis Penunjang (PBPN) : S1 Marketing Management, S1 Financial Management, S1 Business Administration or relevant. Staf Pemasaran dan Pengembangan Bisnis (PPPB) : S1 Marketing Management, S1 Financial Management, S1 Graphic Design or relevant. Staf Pelayanan (PL) : S1 Economics, S1 Communication Studies, S1 Visual Communication Design or relevant. Staf Fasilitas (PF) : S1 Shipping Engineering, S1 Civil Engineering, S1 Architecture or relevant. Staf Teknologi Informasi (PTI) : S1 Information Technology or relevant. Staf Operasional (PO) : S1 Management, S1 Business Management, S1 Shipping Engineering, S1 / D-IV Transportation or relevant. Staf Teknik Kapal (PTKA) : ATT II / D-IV, S1 Shipping Engineering, S1 Mechanical Engineering. Staf K2L (PK2L) : S1 Mechanical Engineering, S1 Shipping Engineering, S1 Port Management (Tatalaksana Pelabuhan), S1 Civil Engineering, S1 Environmental Engineering or relevant. Staf Sumber Daya Manusia (PSDM) : S1 Psychology, S1 Human Resource Management, S1 Information Technology, S1 Industrial Engineering, S1 Administration or relevant. Staf Manajemen Resiko (PMR) : S1 Statistics, Management S1 or relevant. Staf Pengelolaan Rantai Pasok (PRP) : S1 Industrial Engineering, S1 Management (operation), S1 Civil Engineering or relevant. Staf Keuangan (PKEU) : S1 Accounting, S1 Financial Management or relevant. Staf Akuntansi (PA) : S1 Accounting or relevant. Staf Manajemen Aset dan Asuransi (PASS) : S1 Accounting or relevant. Staf Perencanaan Strategis Perusahaan dan Transformasi (PPSPT) : S1 Financial Management or relevant. Staf Satuan Pengawasan Intern (PSPI) : S1 Management, S1 Accounting / Finance or relevant. Staf UAJ & kerjasama (CUAJ) : S1 Marketing Management, S1 Financial Management, S1 Business Administration or relevant. Staf Usaha Pelabuhan & Penyeberangan (Diploma) (CUPP) : D III LLASDP or relevant. Not older than 28 years of age before 15 March 2018. Have a good health (physically and mentally) and drugs free. JobsCDC.com now available on android device. Download now on Google Play here. Please be aware of recruitment fraud. The entire stage of this selection process is free of charge. PT ASDP Indonesia Ferry (Persero) - Fresh Graduate Program ASDP January 2018 will never ask for fees or upfront payments for any purposes during the recruitment process such as transportation and accommodation.